Happy New Year! 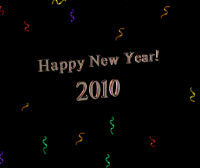 This classic free screen saver floats the phrase "Happy New Year 2010!" around your screen with exploding confetti in the background.